I am tired. My toddler has been home 7 hours, and I'm counting the minutes until bed time (117 minutes to be exact). Rooster was gone to his grandparents' house this week while my husband was at church camp, meaning Cupcake and I had the house to ourselves. It was nice. I got A LOT of work done and even got a chance to do some serious blogging (although I didn't post a thing, so please forgive me!). I enjoyed caring for just one baby who mostly stays where you put her and isn't tall enough to drag all the toys off the shelf! I forgot how fast toddlers were and how much energy they have and how loud they can be. I missed my boys like crazy, CRAZY! But I enjoyed the break from the constant noise and motion. I often talk about what a blessing my children are, but it's not until one of those blessings spends a week away from home, that I am reminded how much work they can be! Day to day I get so used to the routine of caring for little ones, that I forget just how much patience and love it takes to get through the day. Yes, my children bring me joy. They are the greatest ministry I have to offer the world, raising and teaching young disciples who will one day live and work in the kingdom of God. But those blessings come with burdens. Messes to clean. Bottoms to wipe. Bruises. Cutting teeth. Crying. Fit throwing. Boundless energy. They demand my attention until I find myself beyond exhausted and just praying for bedtime (110 mins). And yet, I'm reminded of what Jesus says in Mathew 5. Blessed are poor in spirit...Blessed are they that mourn...Blessed are those who hunger and thirst. Blessed are those who bear burdens from the Lord. Because they shall be comforted...They shall be filled...They shall see God. Sometimes our greatest blessings come in the form of burdens to be carried, to be loved, to be chased around the living room. 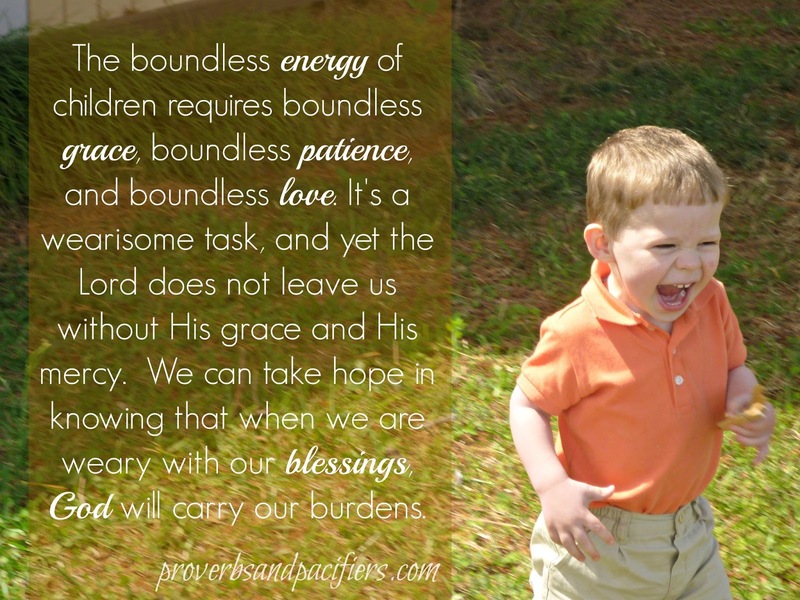 The boundless energy of children requires boundless grace, boundless patience, and boundless love. It's a wearisome task, and yet the Lord does not leave us without His grace and his mercy. We can take hope in knowing that when we are weary with our blessings, God will carry our burdens. Lord, help me be more like you, slow to anger, abounding in love. Help me delight in these blessings and allow you to bear my burdens. In Jesus Name, Amen. What a terrific post. I really love how you incorporated the scripture. I have my moments now, with my 1-month-old guy. I just read 1 Corinthians 13, via The Message, and it stopped me in my tracks! The phrasing made an impact. I show my love for him by just being patient and being there for him. Same goes for my husband! We are both on edge these days because we're tired and learning, so it's tough to be affectionate with each other. Anyway, I appreciated this! I read it yesterday when you posted it but couldn't comment on my phone for some reason. So I saved it so I could reread it and make sure I let you know! And thanks for taking the time to come and comment. I feel so blessed that you went out of your way to encourage me! I just have to say though, I disagree that children are ever burdens. A "burden" is something that weighs us down. Children lift us up-away from ourselves and to the Lord. Psalm 127 does not say "Children are a blessing and a burden from the Lord." Yes, they are a lot of work! But if our life's purpose is to invest in our children, then that work is worthwhile, not burdensome. It's exactly what God gave us time for. 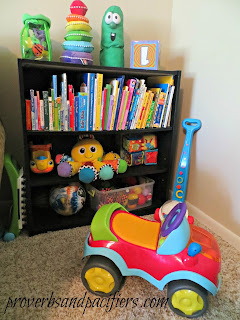 I have 2 children 12 months apart, and I have found that the only time it is truly hard is when I'm expecting it to be easy. Those are just my thoughts. God bless you and your sweet family!